It is so amazing how mother nature can transform herself. As the temperatures heat up around the globe, many will behold the winter’s thaw nourish the lawns and other places. This is a sure sign that spring is here and some of us will be planting the vegetable and flower gardens. When it comes to the culinary side of things, our palates also go through a great transformation (well, I can say so myself). It’s like a spring cleaning within. As a result, we tend to go a tad lighter in our choices. Although we may cook the hearty stews and other dishes, we tend to incorporate a few healthier ingredients. That was on my mind when I purchased some fresh asparagus. They remind me of spring. I was elated to get same because the prices were quite reasonable. I fetched close to a pound for $1.90. I did a quick blanch of them and warmed a drizzle of olive oil and crush garlic in a skillet. Asparagus spears were then placed in pan under low heat for a couple of minutes so as to absorb all the great flavors. 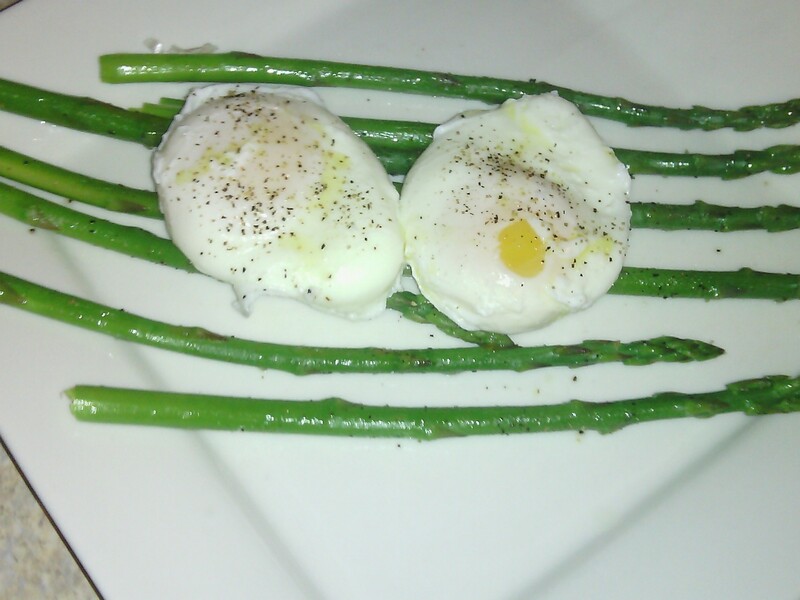 I served asparagus with Easter’s popular food item (eggs). I continued the healthy mode by poaching two large eggs. Eggs were cooked to a perfect finish with soft yolks (the way I like it). After draining eggs on paper towel, I drizzled with olive oil and sprinkled with salt and black pepper taste. Guys, it’s springtime! Happy spring!